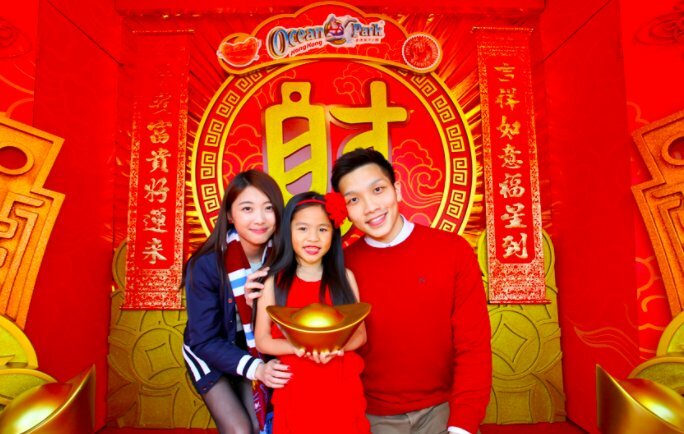 Celebrate the Lunar New Year with VR experiences at Ocean Park! Get on the first VR roller coaster in Hong Kong: The Mine Train presented by Samsung Gear VR, and start a thrilling journey that stimulate all the senses. More exciting Chinese New Year shows and luck-bringing decorations abound throughout the Park create plenty of opportunities for lucky selfies! Soar into a new year on the first VR roller coaster in Hong Kong: The Mine Train presented by Samsung Gear VR! Feel the G-force push against your body – it really seems like you are soaring and plunging into the scenes you are seeing. At the Summit, challenge others at action-packed VR games as well! Take more family photos for prosperity at the Lunar Lucky Woof Garden, the peach blossom lane and Ocean Park’s Chinese New Year float! Before you leave, visit the God of Fortune for wealth, and meet the Gods of Wealth, Prosperity and Longevity, accompanied by lucky money children! Everyone woofs the lucky Year of the Dog! Families can get more festive fun at the high-energy drums celebration in Applause Pavilion! Afterwards, kids can visit Whiskers Harbour to demonstrate their beats at a drum zone! A parade featuring life-size traditional puppets creates plenty of opportunities for lucky selfies! Laughs and applause also wait at the modern lion dance show and kung fu gag show! Everyone can join Whiskers & Friends, who are dressed in their lucky best, at a dance show just to wish you lots of fun this coming year!